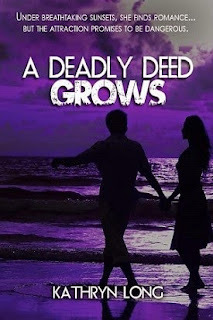 Today we are interviewing Kathryn Long as part of the blog tour for her romantic suspense novel A Deadly Deed Grows blog tour. I am what you may call a “late bloomer” when it comes to writing novels. I started getting published when I was around 50, though I’d been writing as a hobby almost all my life. A couple years ago I retired from teaching reading and writing to teens with mild disabilities. It was a true challenge, but very rewarding. I’m married to a wonderful man and have three talented and beautiful grown children. I enjoy having the freedom to write all day and still have time for other things, too. 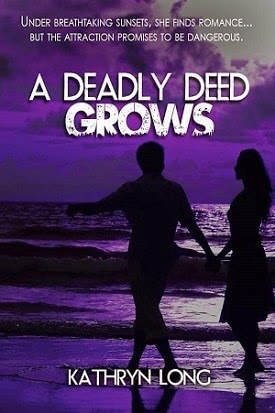 Describe the premise of your romantic suspense novel, A Deadly Deed Grows. Though the suspense of the story – Mira and Sean taking down the bad guy and saving a dear friend’s home – is at the forefront, I’d like to think it’s about love. The spark and excitement of new love between Mira and Sean; the forever devotion of love between Claire and her deceased husband Charles; and the ends people will go to in protecting that love or finding justice for love. Who do you think would most appreciate A Deadly Deed Grows? I think women of all ages, mostly, but anyone who enjoys a wholesome suspense or mystery story. And of course those readers who have a soft heart for a love story. What inspired you to write about people standing up to an unscrupulous land developer? It goes back to all those night time soap operas I loved to watch and still do! To name a few, the villainous J.R. in Dallas, or the money hungry Graysons in Revenge. It’s always about money or the unending greed of it that seems to drive these villains, and I’m all about taking them down! Tell us a bit about the protagonist, Mira Stanley. Mira is a hard-driven and passionate soul who gives her all to anything she attempts. She’s somewhat scarred from a relationship gone sour in her past, but fills that void with working on her career as a lawyer. However, her scruples and emotions show a refreshing side to the stereotype of “lawyer”. When she has a mission -- in this case, saving Claire’s home from the unscrupulous land developer, Bradley Lane – she’ll let nothing stop her. How would describe the relationship between Mira Stanley and Sean Thorndale? Tenuous and complicated, to say the least! In the beginning Mira doesn’t know whether or not to trust Sean. When she stumbles upon certain evidence, she suspects Sean is “sleeping with the enemy”, but her attraction to him constantly has her doubting her suspicions and hoping he’s one of the good guys. Sean is immediately attracted to Mira, but there complications that get in the way. He is torn between what he should do and he wants to do, and whether to confess all this to Mira. I wrote my first poem when I was seven :). However, I didn’t write more seriously until I reached my teens. As an outlet and for pure pleasure I continued into my adult years. It wasn’t until the publishing world became more accessible through internet and email, that I decided to write and submit my first novel – OKLAHOMA’S GOLD. I’ve been on a roll ever since, from self-publishing my cozy mystery Lilly M. series to indie publications for DYING TO DREAM and A DEADLY DEED GROWS. How have you evolved as a writer since when you first started? Hopefully, I’ve improved! I have read most every book on writing and publishing that I could get my hands on to help along the way. However, I’d say just continuing to write one book after another is what really helps. Oh my, there are so many! Mystery and suspense have always been my favorite choices to read as well as to write. Starting with Mary Stewart and Victoria Holt when I was in my teens, then later on Stephen King, James Patterson, James Lee Burke, Janet Evanovich, and the list goes on. All of these have influenced my writing style, I believe. God willing, I would like to keep writing mysteries and eventually land a contract with a bigger publisher, which means finding an agent. That’s always been my goal. But no matter what, to keep writing and share my stories with readers is what I’d like. I’ve already written another mystery that takes place in northwest Pennsylvania amidst the Allegheny Forest, near the Kinzua Reservoir. Our family has a cabin in the area and I’ve been vacationing there since I was a little tike. The story has many Native American elements to it, which is something I’ve always enjoyed researching. I plan to create a series (already started book two) and I’m currently pitching it to agents. We’ll see how it goes. Is there anything else you'd like potential readers to know about A Deadly Deed Grows? Ah yes, the setting … the story takes place along the Florida Panhandle with such locales as Port St. Joe and Cape San Blas. My husband and I first vacationed there in 2008. We’ve been back twice more and love the cape. Many of the sites mentioned such as the Sunset Coastal Grill restaurant are real and places we’ve visited. The first trip inspired me to use the place as a setting in one of my stories.